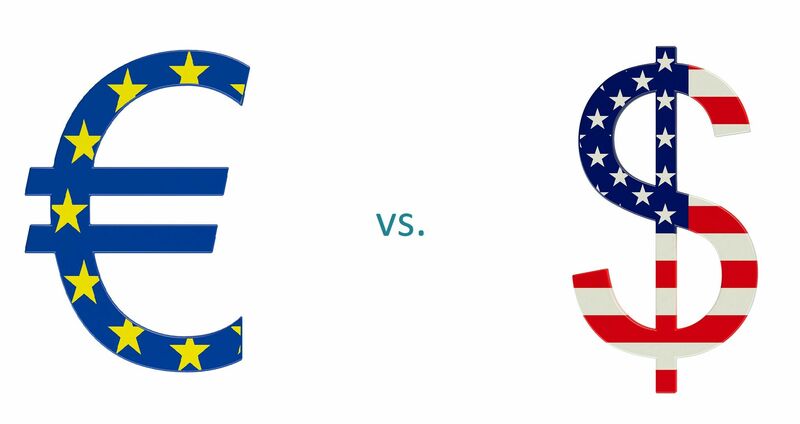 The Euro to Dollar exchange rate (EUR/USD or €/$ for short) is the amount in U.S. dollars that equals 1 Euro. It is the convention for quoting the exchange rate between the two currencies. This guide will provide an overview of the factors that impact the FX rate, currency riskCurrency RiskCurrency risk, or exchange rate risk, refers to the exposure faced by investors or companies that operate across different countries, in regard to unpredictable gains or losses due to changes in the value of one currency in relation to another currency., and what investors and speculators need to know. Let’s look at an example of how to calculate the Euro to Dollar FX rate, and how to change between the two currencies. Q: If the EUR/USD rate is 1.25 and an investor has 364 Euros, how many US dollars would they receive if they exchanged it at the current rate? Q: If the EUR/USD rate is 1.42 and an investor has 267 USD, how many Euros would they receive if they exchanged it at the current rate? Q: If an investor exchanges 796 USD into 610 EUR, what is the current Euro to Dollar exchange rate? Learn more in CFI’s Math for Corporate Finance Course. The exchange rate for the Euro to Dollar is impacted by many economic factors,EconomicsCFI's Economics Articles are designed as self-study guides to learn economics at your own pace. Browse hundreds of articles on economics and the most important concepts such as the business cycle, GDP formula, consumer surplus, economies of scale, economic value added, supply and demand, equilibrium, and more as well as political events on both sides of the Atlantic. A summary of factors that impact each country is listed below. Employment rates, job creation, etc. Unemployment ratesCyclical UnemploymentCyclical unemployment entails layoffs, due to an economic recession or depression. Employees are able to reobtain their jobs once the economy expands again. 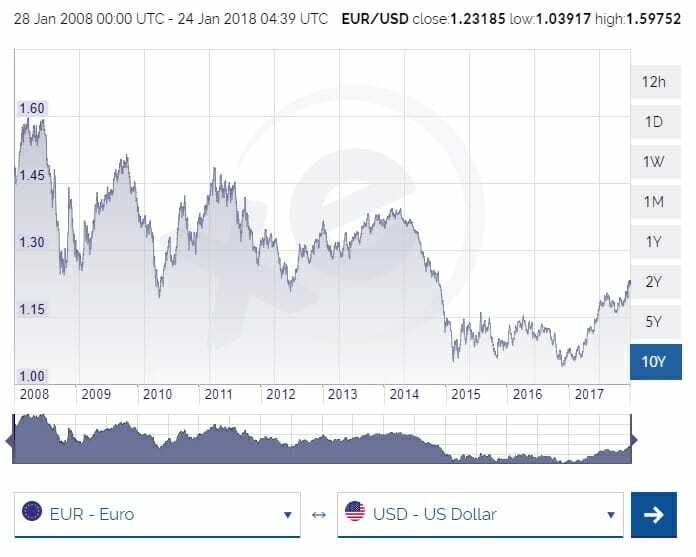 The chart below shows the Euro to Dollar exchange rate during the past ten years, spanning from 2008 until 2018. You will notice that the FX rate has ranged between 1.039 and 1.598 during that time period. That range is basically from near parity – almost a 1:1 exchange rate – to approximately $1.60. From 2008 to 2014 the Euro was rarely worth less than 1.3 US dollars, however, between 2014 and 2015 it dropped all the way down to about 1.04. For three years, the FX rate remained relatively range bound between 1.04 and 1.15 until breaking out above 1.22 in early 2018. Forex Trading GuideForex Trading - How to Trade the Forex MarketForex trading allows users to capitalize on appreciation and depreciation of different currencies. Forex trading involves buying and selling currency pairs based on each currency's relative value to the other currency that makes up the pair. Top Forex Trading Tips5-Step Guide to Winning Forex TradingHere are the secrets to winning forex trading that will enable you to master the complexities of the forex market. The forex market is the largest market in the world in terms of the dollar value of average daily trading, dwarfing the stock and bond markets.